CPM got featured in today's edition of The Irish Examiner. In the article, our Client Service Director, Mel Carson, talks about our current job opportunities and how we keep our promise of 'Growing Sales for Clients, Powered by Our People'. A big nationwide recruitment drive is currently underway with CPM which includes face-to-face residential and business sales roles. CPM specialises in helping clients deliver sales targets through a range of fully managed services, including residential and business customer acquisition, retail sales, merchandising teams, in-store promoter, demonstrator and sales process support. Mel Carson, Client Service Director for CPM said: "This is a great boost for CPM so early in the year. We currently have roles nationwide with great opportunities for enthusiastic and hardworking people, and I would encourage anyone interested in a career in sales to come talk to us." "CPM is recruiting on an ongoing basis for sales people. Sectors we work with include: the Energy market, Telecommunications, Retail, FMCG, Consumer Electronics, Charity, Hardware, Utilities and Entertainment. We work with a range of clients including; eir, SSE, Airtricity, Nielsen, GSK, MSF, Dogs Trust, Britvic, Microsoft, Black & Decker, Diageo and LRS to name but a few. The types of roles we recruit for are Residential and B2B Sales and Management roles, Back Offices Support functions, FMCG Sales Developers, FMCG Merchandisers, Market Researchers and Charity Fundraisers. 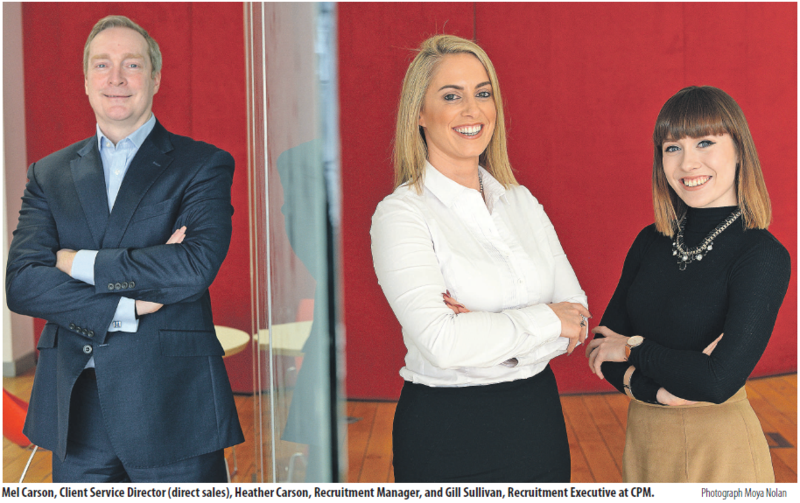 Ongoing growth amongst CPM's client companies has led to this recent surge in available positions, and Residential sales people can expect an on-target- earnings of €35,000 to €45,000, Business sales on-target earnings of €40K - €55,000 plus car allowance and other generous benefits; and FMCG base salary of €20,000 to €25,000 plus bonus. 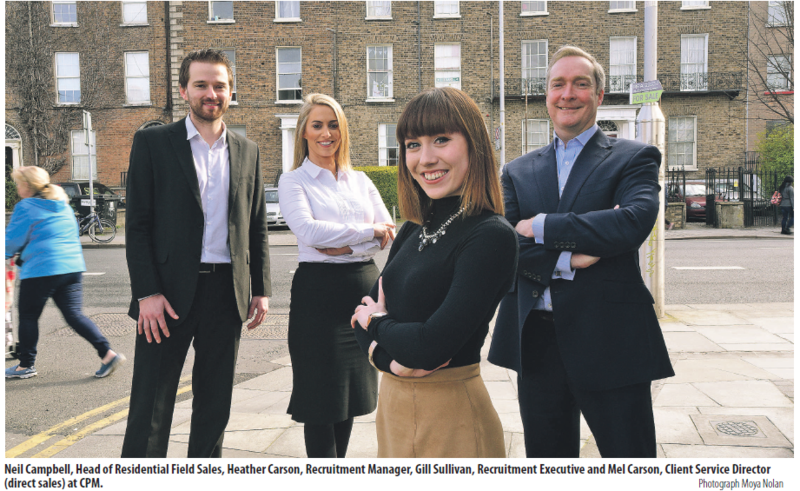 CPM has over 120 available roles - including 100 Field Sales Representatives for Direct Sales (Residential and B2B) nationwide, Market Researcher roles (Island of Ireland) and office roles involving Business Support and Administration. " We are looking for a variety of skills and experience from applicants. For some roles no experience is necessary as full training will be provided by our dedicated in house trainers, and all roles offer great career progression opportunities for enthusiastic and hard-working people." Driven by a commercial message - 'Growing Sales for Clients, Powered by Our People' - CPM will continue its successful growth into 2017. "Our people are our finest assets and we have a strong belief and culture to grow our own. We love to see our staff progress in their careers and so our aim is to promote from within. Whether someone is starting their career or looking to progress, CPM will help them along the way." CPM work with a multitude of indigenous and multinational companies, not just in Ireland, but across 19 countries around the world, ensuring that opportunities to work with high calibre organisations and gain global experience are also available. CPM Ireland forms part of CPM Group; one of the world's largest outsourced field marketing and sales companies and is a part of the DAS Group of Companies, a division of Omnicom Group Inc.